We were up, as usual, at 5 am. We lounged around, drinking coffee, surfing the net, and having breakfast, again--as usual! Seems to be our set routine here in Paris. We had plans for this morning--or should I say I had plans, and David was tagging along. 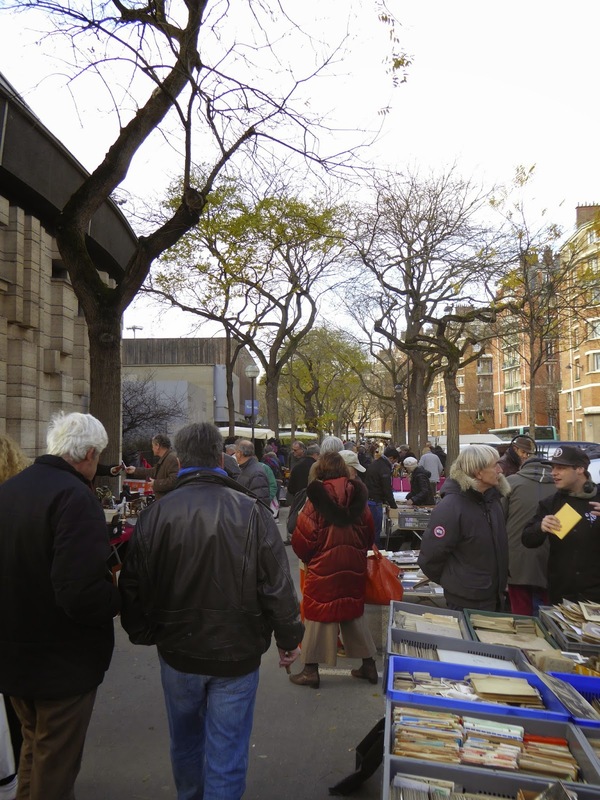 Our destination for the morning was the Porte de Vanves Flea/Antique Market, which is held every Saturday and Sunday. It starts at 7 am, I think the really serious buyers get there early, but I'm only a serious browser, so it was about 11 am by the time arrived. 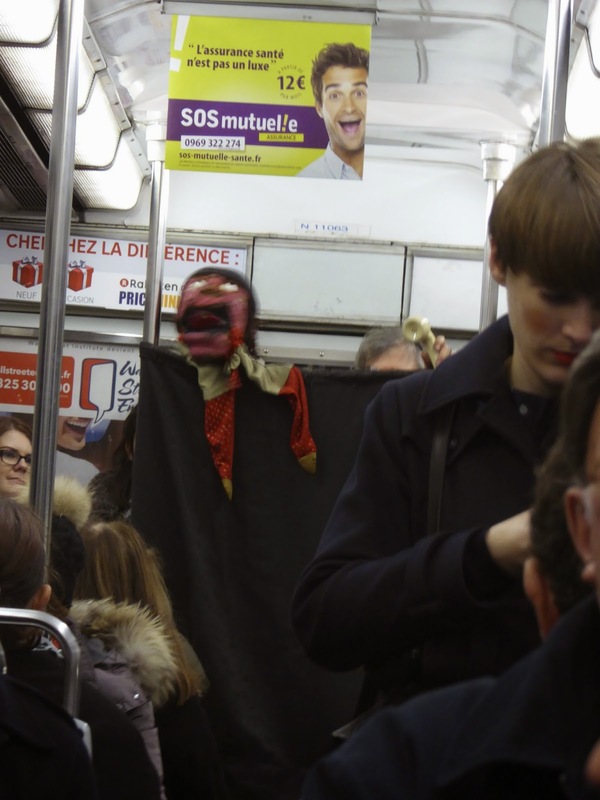 We had some unusual entertainment this morning on the Metro--a very noisy puppet show! A few people had strung up a black curtain across the very back of our car, and proceeded to do a short little show. Of course, we couldn't understand a word. So far we've had singers, accordion players and a really good saxophone player. Quite entertaining! As you can see by this picture, Parisians are totally unimpressed with this puppet show (so were we), they also just ignore other entertainers on the cars, who are usually Roma gypsies looking for tips. Of course, we had checked the weather forecast before leaving--I think they lied to us! It wasn't raining--in fact we actually saw the sun a couple of times. But it was freezing cold, and we hadn't bundled up with enough layers. Brrrrr! This market is a big one, and we had decided to cruise in an orderly fashion--up one side and down the other. We only made it about half way through, and noticed vendors were packing up. I think they were cold, too! I have plans to go back next Saturday…………. 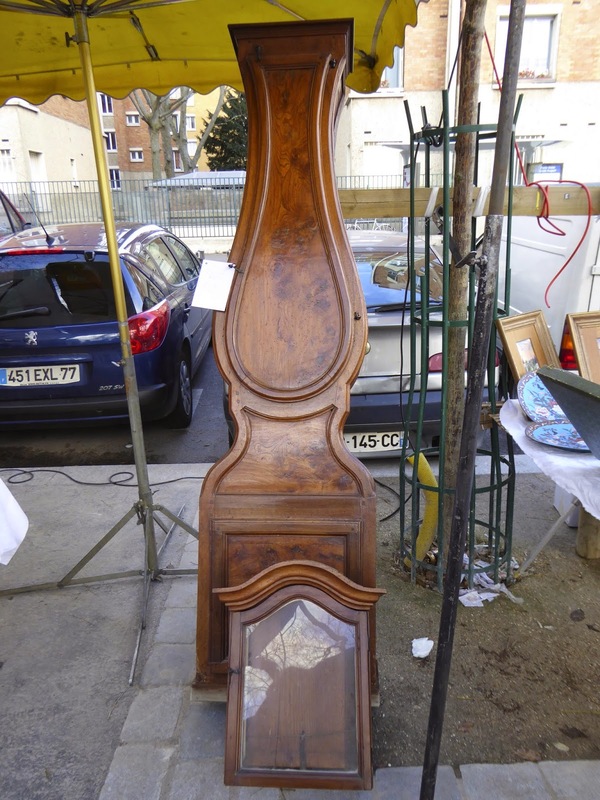 There was lots of beautiful old furniture--too bad I can't get it home! I did find a couple of "treasures" for my collection of folding rulers, though! These are both metric (of course) and they're very small. Luckily, I collect pretty weird stuff that isn't high priced…. We sadly left the market, (well, David NOT so sadly!) We were just about frozen, so we decided to stop in the nearest cafe and have a hot lunch, and we found one near the Metro stop. It was the same one we ate at our last visit to Vanves--summer of 2010. Except we sat outside that time, but not today! We each ordered the lunch special, roast pork with mushroom gravy, potatoes Dauphinoise, and roasted brussel sprouts. And, of course a carafe of wine! It really hit the spot, and we lingered until we were thawed out. We needed to buy some groceries, so we Metro'd back to our neighborhood and went to our local supermarket. We trudged back up the hill with our heavy groceries, put them away, and decided to relax and warm up a bit before heading back out for the evening. 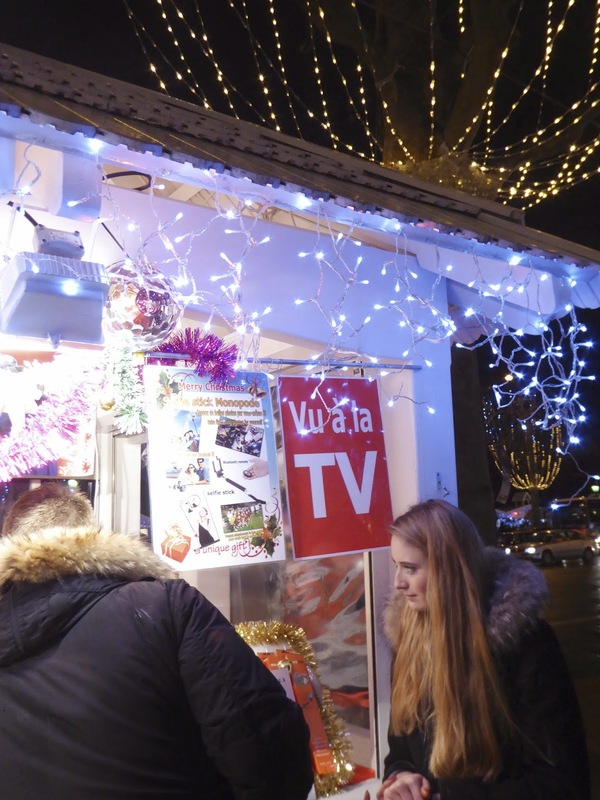 We wanted to visit the Champs Elysees Christmas Market again, and this time we started at the other end, very near the Tuileries Garden. We came out of the Metro to this pretty sight--the Luxor Obelisk. The obelisk once marked the entrance to the Luxor Temple. 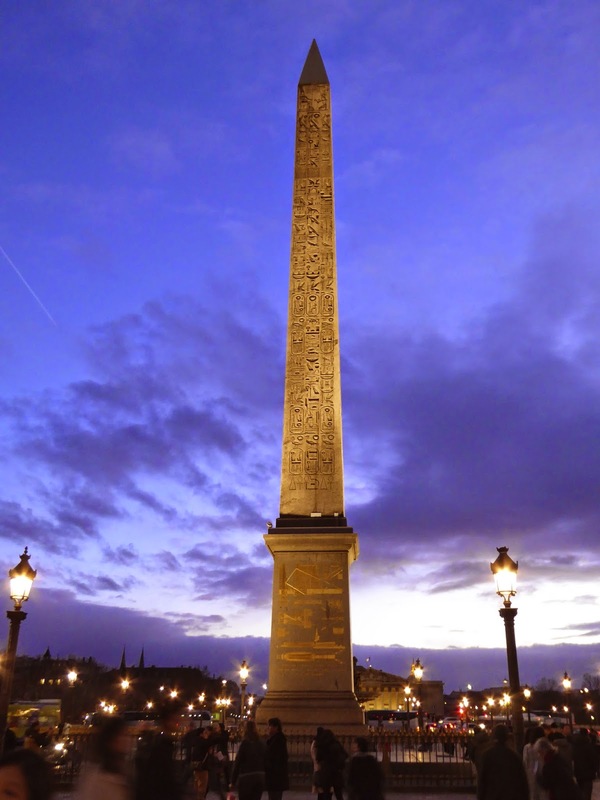 The Ottoman viceroy of Egypt, Mehmet Ali, offered the 3,300-year-old Luxor Obelisk to France in 1829. It arrived in Paris on 21 December 1833. Three years later, on 25 October 1836, KingLouis Philippe had it placed in the center of Place de la Concorde. The Obelisk is truly magnificent, and it's pretty impressive that it's still standing! 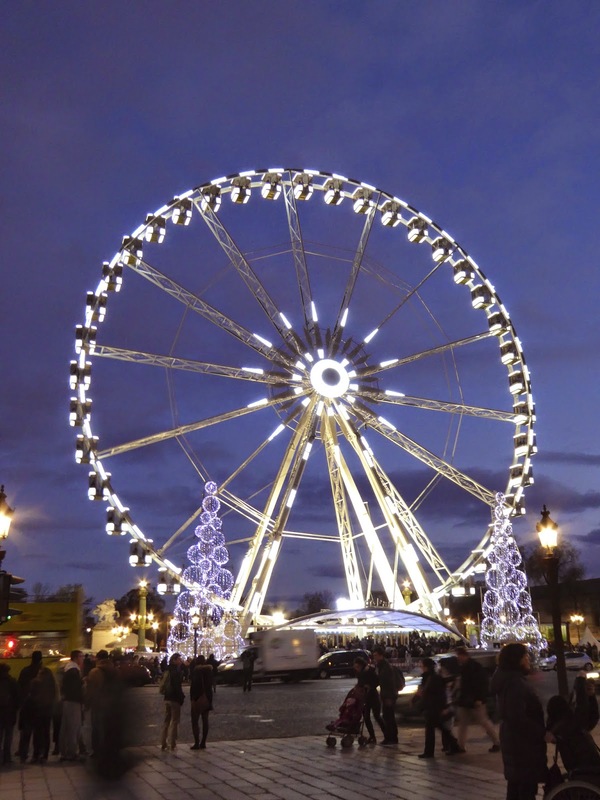 The Place de la Concorde is also where the La Grand Roue of Paris. It's huge! We plan on a spin--but decided to wait until the line isn't a mile long! I'm sure the views are amazing. We crossed several lines of traffic, and finally came to the start of the Market. 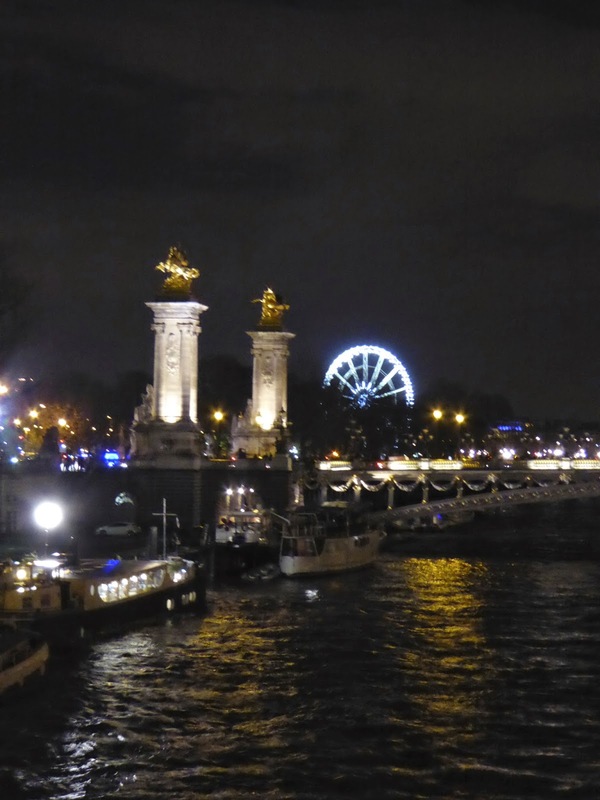 This view is taken from the middle of the Champs Elysees, looking toward the Arch de Triomphe. It is so sparkly and beautiful! It was pretty mobbed--but we persevered for several blocks. We shared a hot wine and some roasted chestnuts--mmmmmm good! See, I told you there was lots of "As Seen On TV" stuff--here's a whole booth full of French "As Seen on TV" Junque! About half way along the boulevard we spotted Santa AND his sleigh in the sky! I think it was suspended on a cable between two tall cranes, and it made it's way back and forth. There was a live Santa in the sleigh, and he would stand up and talk to the kids--they loved it! It was pretty cute. After about an hour of the market and the crowds, we decided it was time to hop on the Metro back to our neighborhood. Hmmmmm--the best laid plans! We saw a HUGE crowd of people up ahead, and couldn't quite figure out what they were looking at/waiting for. Well--they were waiting to go down the steps into the Metro! Can you imagine the mess IN the Metro? We didn't want to find out! 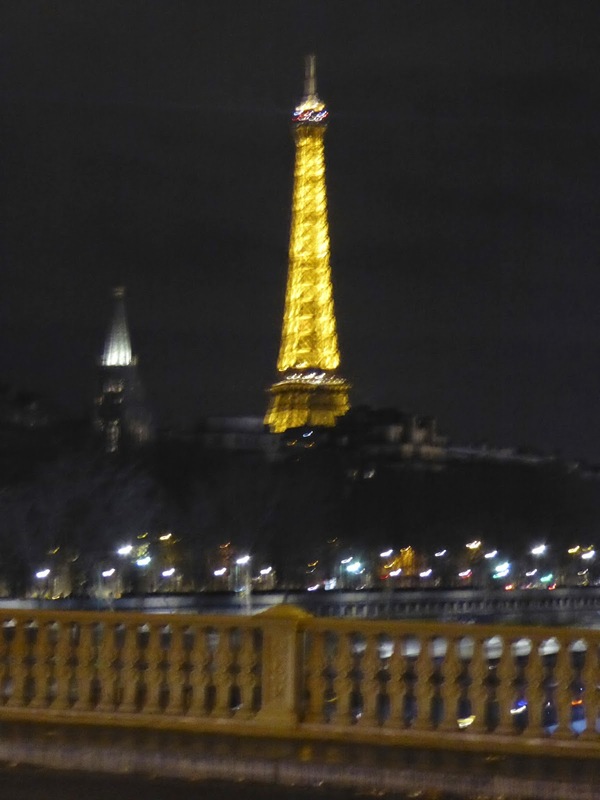 After a quick discussion, we decided we'd walk to a different Metro, and we saw this beauty shining in the distance. We walked towards the tower--can't get lost that way! We walked and walked and walked--finally ending up in our "old" neighborhood Metro stop. We easily found our way home from there. We had a late dinner at a restaurant near our apartment--La Pierrade, at the corner of Rue Yvonne le Tac & Rue des Martyrs. We'd looked at the menu in passing, and it looked interesting. They specialize in fondue and racelette, but we didn't feel like more cheese, so we had the "formule du soir, or choice of the evening. We each chose a different starter, and a different main dish. David ordered the escargot--six delicious buttery little slimy things! For my main dish, I chose Boeuf Bourguignon, it was melt in you mouth tender and delicious. The red wine sauce was scrumptious! A carafe of red wine rounded out our dinner, and we shared a small creme brûlée; a perfect ending to another lovely day in Paris. It was a short 1/2 block walk to our apartment, and these Travelin' Lundburys are going to bed early--we're just pooped! I can't believe you found two more folding rulers. A 5-star find! !